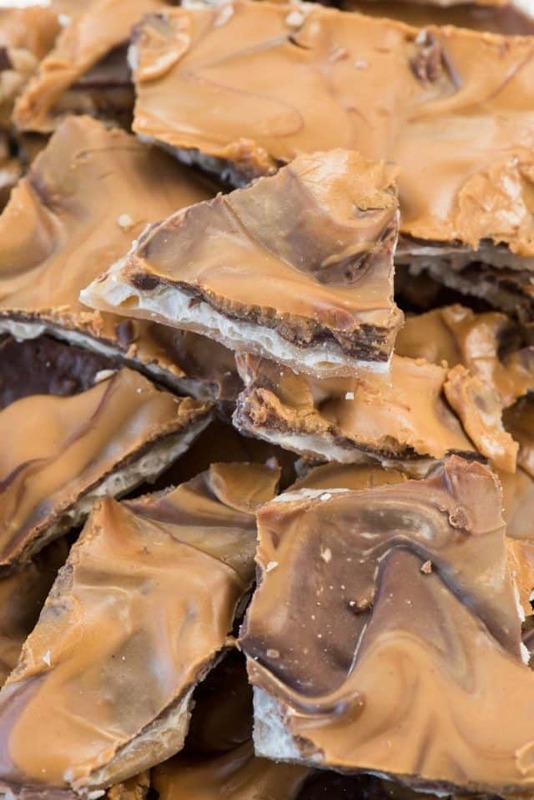 Peanut Butter Toffee Bark – this is the perfect crack bark recipe! Homemade toffee is baked on matzo crackers and topped with lots of chocolate and peanut butter. It’s pure heaven and EVERYONE raves about it. I first made this recipe in 2010 and have been making it multiple times every holiday season since! There are very few recipes on this blog I make over and over again. I know that seems strange, right? It is strange – if you’re not a blogger. But as a dessert blogger I have to come up with new recipes all the time. By the time I’m done with all those new recipes, there’s no time or space in my jeans to make things over again. I do have exceptions, like Elmer’s Brown Sugar Pecan Pie, my Crumb Apple Pie, Cheesy Egg Casserole, and Cornbread Stuffing. Those are all holiday recipes and they get made year after year. Even being in the food world doesn’t exempt me from my continuing traditions (like monkey bread and cinnamon rolls every Christmas morning). One recipe I make every single year: this Peanut Butter Chocolate Bark. The recipe is from a Rachael Ray magazine from years and years ago. I made it for Christmas gifts and got SO many compliments on it. The next year I doubled the batch and the year after…you get the drift. Now I make it special for Mel every year. Peanut butter is one of his weaknesses…and so is toffee. This recipe combines BOTH! Peanut Butter Chocolate Bark is the best kind of candy crack: it’s got chocolate AND peanut butter! That’s right: it’s candy crack (aka toffee) with a chocolate coating AND peanut butter swirled in. It’s all the best things in the world in one place. The base of any crack recipe are crackers. In this recipe, I use matzo crackers. Matzo is an unleavened (crunchy) flatbread that is mainly used during Passover. Taste-wise they’re like saltines and perfect for making cracker toffee. If you don’t have them or can’t find them (usually in the ethnic food aisle) you can use saltine crackers or even Ritz crackers or graham crackers. The toffee part is easy, even though you might think it’s hard. You melt butter and sugar together and cook it until it reaches 255°F on a candy thermometer. I know, I know, another kitchen gadget. But it does come in handy and you really do need one to have success with making toffee. You don’t want it too chewy or too hard. 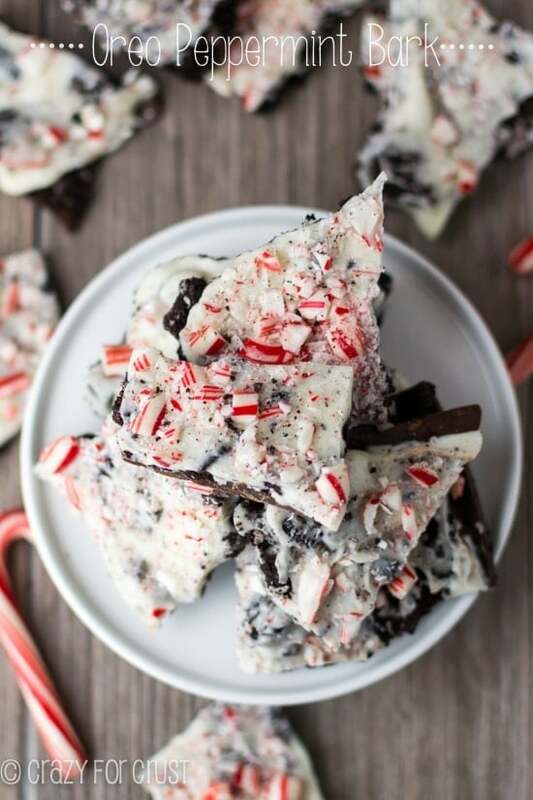 This candy crack recipe is PERFECT for the holidays and gifting. It packages and ships well and everyone loves it! Get all your ingredients ready beforehand. The sugar mixture will cook awhile but once it’s done things move fast. You can check to see if your candy thermometer is working properly by boiling a pot of water. At sea level, water boils at about 212°F or 100°C. If you don’t have matzo crackers, you can use saltines, graham crackers, or even Ritz crackers. This is a great candy recipe for gifting – it ships well too and lasts a long time in the refrigerator. Offset spatula – makes spreading chocolate easy! 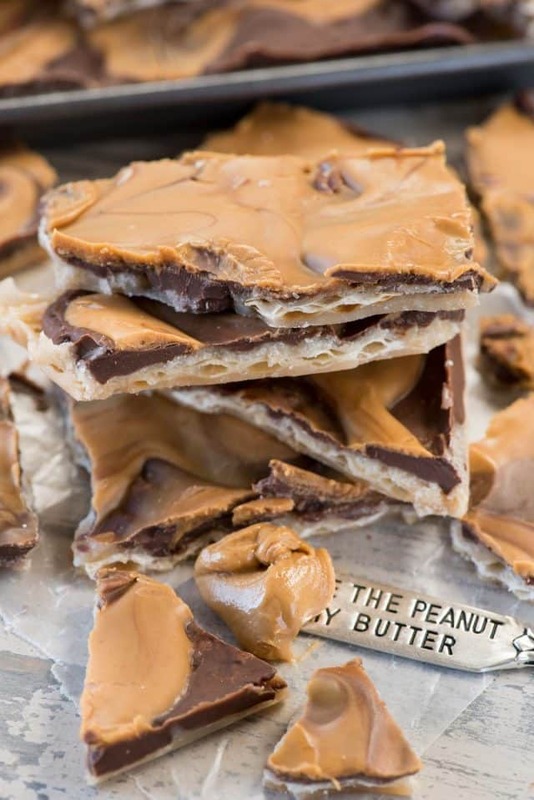 Peanut Butter Toffee Bark - this is the perfect crack bark recipe! 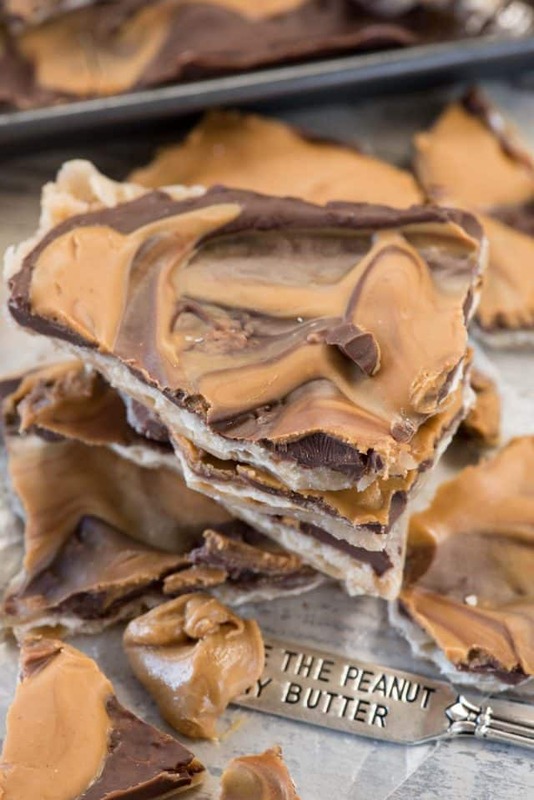 Homemade toffee is baked on matzo crackers and topped with lots of chocolate and peanut butter. It's pure heaven and EVERYONE raves about it. Place matzo crackers in a single layer on the cookie sheet, breaking as needed for them to fit. Set aside. Once it reaches 255°F, remove from the heat and stir in the vanilla. Pour over the crackers in prepared pan and spread to coat evenly. Bake for 8 minutes. After 8 minutes, sprinkle the chocolate chips evenly over the hot pan. Place back in the oven for 2 minutes, or until the chocolate chips are melted (but they’ll still be holding their shape). During the 2 minutes, heat peanut butter in a microwave safe bowl for about 30 seconds, or until pourable consistency. Crack bark is one of my favorite things. 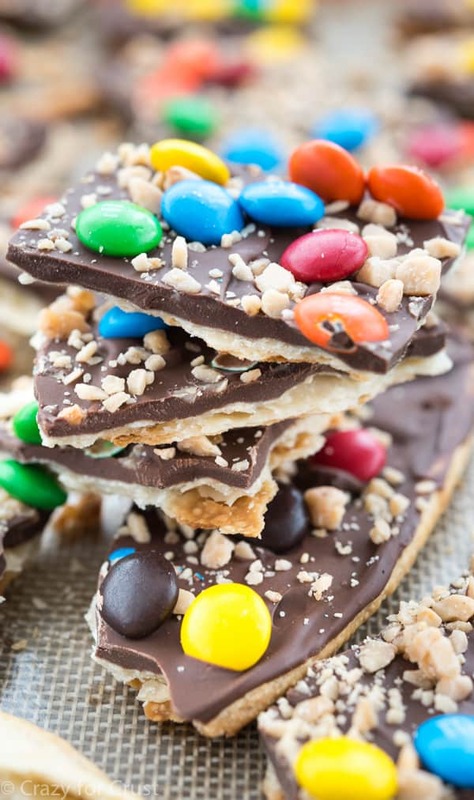 I cannot wait to try these other versions by my friends: Ritz Cracker Toffee by my friend Holly, Aimee’s Holiday Candy Crack (3 ways! ), and Pecan Pie Bark from my friend Ashley. Your recipes are fabulous, the commentary is fun and the pictures are fantastic! Oh nooooooo! How will anything in the world be ok until I am feasting on this!?! Matzo sheets are foreign to me so I don’t know how big they are or how many soda, graham or ritz crackers to use. Please use things most people are familiar with. I did not make this recipe as I don’t know how many crackers to use. I think a lot of people are familiar with matzo sheets. And believe me, I have gone to great lengths to use things in my recipes that are readily accessible at the store. As for how many crackers, it depends on what you’re using. You’ll probably need about 45 saltines or Ritz crackers. Graham crackers, about 9-12 sheets. Just fill up your pan…there really isn’t a science to it. Try the matzo though….It’s great and they’re good crackers too. I’m right there with you Dorothy…this is my GO-TO recipe for any party, hostess gift or bake sale. Hard part is not eating half of them before the guests arrive! great recipe, the peanut butter is a genius added ingredient, at least to the ones I’ve made that just feature chocolate, so thank you! 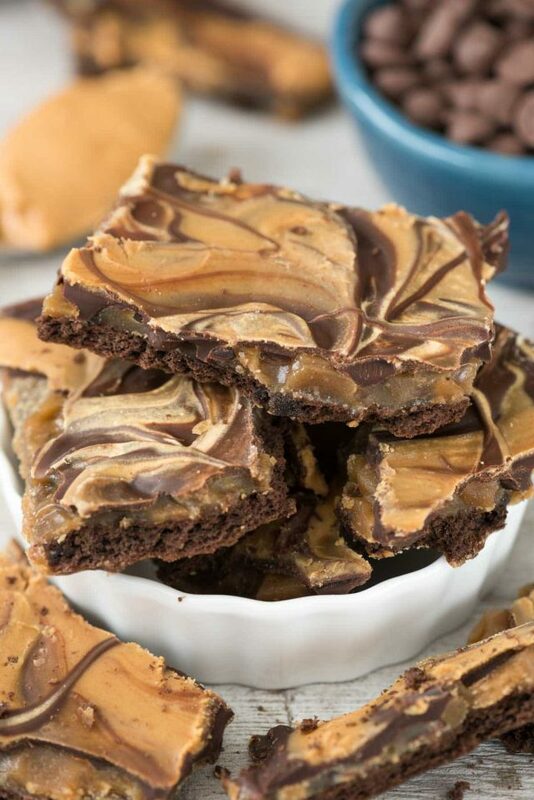 ooooh I love toffee and adding peanut butter in addition to the chocolate just makes this even better!! !